Why “The Tree House” was built and the light from within…. Ever since The Tree House started, which was inspired and supported by friends who have since become my rock, I started to sense it was now time, we had an official logo. Something we could be proud of and reflected who we are. Upon expressing my wishes to my husband (who set out to try and initially surprise me) His first logo for me, us, was extremely hippy themed. I liked it so but it wasn’t “Us”. Taking ample time before showing it to the rest of the admin team for their opinions which were more or less the same of mine. Finally I plucked up the courage and asked him for his help in designing a new logo but with me. Fresher, simpler and more like “Us”. We started right from scratch. keeping the outline of the hands signing “Tree”. I requested simple leaves, no lines but shaded, placed flowingly yet well arranged. Poor hubby was ever so patient – “Turn this leaf this way up a bit more, this one over there” and so on. Work in progress was being realised. For some reason, I did not want a house on it as I felt that would interrupt the peaceful flow, making it less unique, less original and less modern. I hesitantly made one more last request, an internal light coming from within the tree symbolising the warmth of its members within the Tree House. This became the final piece of the jigsaw and suddenly before me, was our logo – a work of art. I could now, feel the warmth from the artwork my husband (very patiently!) conjured up for me. 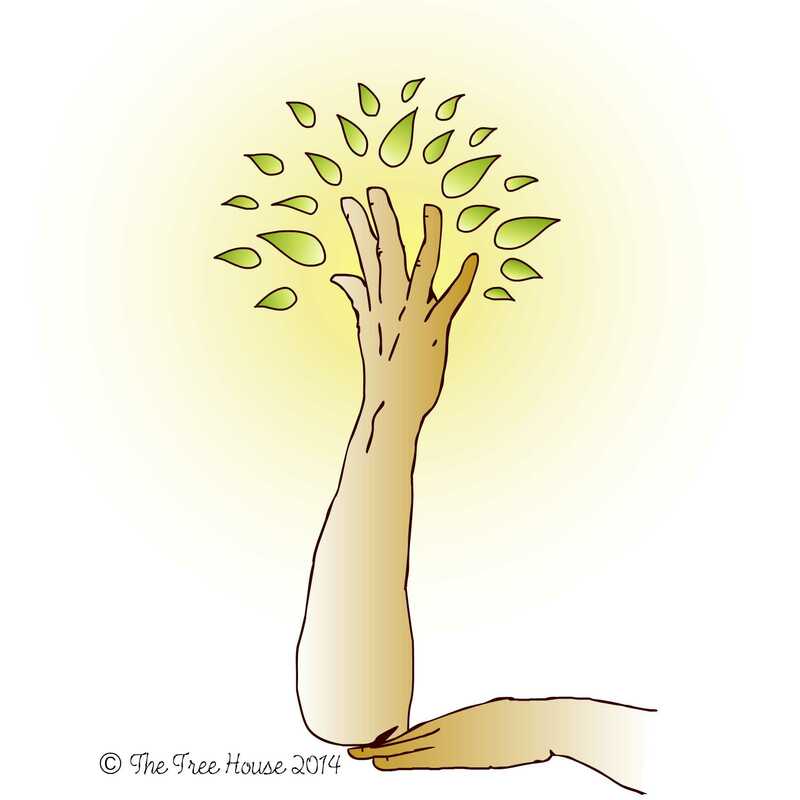 Every time I peek at our new official logo, I beam that little bit more, with warmth, hope and respect for everyone who has been a part of the Tree House since day one, at present and in anticipation. Much to my relief as I woke, it proved very popular and was admired. A few suggested there was no need for the second arm to which I pointed out, those who do not know the sign for “Tree”, the second arm looked like its shadow while a friend commented saying “the other hand symbolises the roots and stability as the tree continues to flourish and grow.” Spot on. I am not one to take pride in anything because pride to me, is not a good attribute to have yet seeing how Tree House has been, is being nurtured, continuing to bloom and grow by the people making it what it is – I cannot help but be in awe of everyone. The Tree House has saved me, my life from darkness and influence that was fast swallowing me up. My husband and newfound circle of friends who have been there for me without fail, without judging me, without realising it so – I hereby dedicate this post, and our official logo which is original and unique – the only one of its kind. To each and every one of you, for being the light from within. Thank you ever so, for being you – I am honoured to be graced with the pleasure of your company.